An 80-hectare site has been chosen to build the track in the south-west of Moscow near the Vnukovo Airport by 2016. 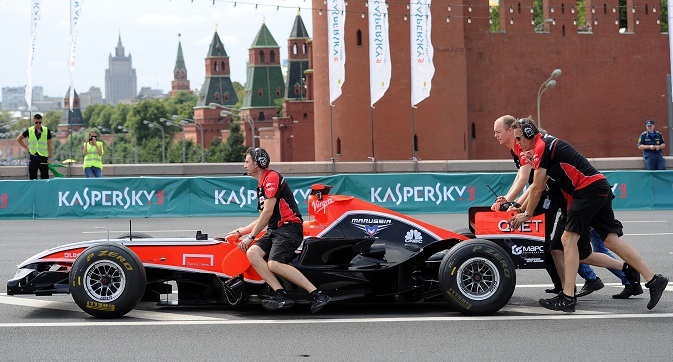 The Russian capital is holding on to its plans to host a Formula 1 race. Moscow's Acting Head of the Department for the Development of New Territories Vladimir Zhidkin told RIA Novosti that a new F1-compliant track may be built in one of Moscow’s newly-annexed territories as early as 2016. This is not Moscow’s first bid for hosting F1 races. In 2000, authorities announced that an autodrome would be built in the Nagatino floodplain, and later suggested that a new track could be constructed in the north of the capital by the Sheremetyevo Airport. However, neither project gained traction. Under the agreement signed in 2010 with Formula 1 president and CEO Bernie Ecclestone, Russia will host the 2014 Russian Grand Prix. A brand new track is now under construction in Sochi and will encircle the Olympic Park. The total area of the construction site is 36 hectares, with buildings occupying 104,500 square metres of it. The track has a 5,854-metre lap and a shorter, 2,312-metre lap. The main stand will hold 13,631 spectators, and temporary ones will hold an additional 29,160 spectators. Three organizations are in charge of construction: Omega Centre and Formula Sochi (both 100% owned by the regional administration), as well as the Russian Automobile Federation. According to the Krasnodar region’s Vice-Governor Nikolai Buturlakin, the budget of the project, financed by both regional and federal governments, is 7.9 billion roubles (around $240 million). As of today, over 50 percent of the track surface has been constructed. The Moscow Raceway near Volokolamsk (in the Moscow region), another track which could host Formula 1 races, is already in operation. Last year the track administration announced the signing of a three-year contract for hosting German Touring Car Masters (DTM), Europe’s most popular international touring-car series. It was on this track that Russia first hosted World Series by Renault race. Moscow Raceway also has a five-year contract with World Superbike, one of the world’s most prestigious motor series. Today Moscow Raceway is Russia’s only FIA homologated circuit, its 1T grade allowing for any world-class circuit race, including F1 (following the completion of additional spectator seating and a media centre). The track is also classified as a FIM B grade course (meaning it can host any motorsport event other than MotoGP-class ones). Moscow Raceway is owned by the Strategiya Company, one of whose beneficiaries is Development Capital Bank co-owner Rustem Teregulov. A total of 5 billion roubles (about $150 million)was invested into the project.